Critical-Gaming Network - Blog - Composition. This isn't a Game! Composition. This isn't a Game! Recently in an episode of 1up Yours (possibly the Live at PAX show), Shane Bettenhausen expressed how the music editor in the upcoming Guitar Hero 4 is, in his opinion, too complex/complicated and that the would like it to be more user friendly/casual so anyone can make awesome songs. 1) From what I've seen of Guitar Hero 4's editor, it's not complex enough. Though I don't have a lot of details, I have doubts about the level of music that can be created without incorporating some kind of a sheet music style system. Band Brothers, a Japanese DS game, has a top notch music editor that I used to input a Jason Mraz song. Guitar Hero 4 better top an old DS game. 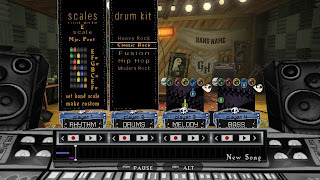 2) If Guitar Hero 4 intends on providing serious music composition tools, then there won't be any options or design possible that will magically imbue the player with the ability to understand and write music. Music is complicated. It takes years of practice and study to come to terms with. I know this from first hand experinece. I've been playing and writing music most of my life. For the people who want to be rock stars and even write their own music without putting in the work to learn music, keep dreaming. I know Guitar Hero helped (virtually) realize some of those dreams, but it can only do so much.